“Back in the day” as they say, a home’s lighting needs consisted of making sure bulbs were bright enough and centered in every room so our eyes wouldn’t strain as we entered a space. And if you had a few extra bucks, you might splurge on an eye-catching chandelier for your entryway or dining room, and maybe accent the room with a pair of table lamps. That’s all changed now. The current trend in home lighting is to select smaller, more stylish efficient LED light fixtures that do the job of their incandescent predecessors while consuming much less energy. In addition, consumers are also seeking better, uncluttered lighting controls and switching to create incredibly practical, functional and easy-to-illuminate zones within the home. We are seeing this trend become increasingly popular with our clients, and I think that’s great. My love of technology makes this a passion of mine; it’s very rewarding to see how we’re able to positively affect lifestyles by designing and integrating smart, efficient contemporary lighting plans within the homes we custom build and renovate. How do we do it? Let’s start at the beginning. A big issue that homeowners struggle with is the layout of the entire lighting plan. The layout is critical because it sets the foundation for creating the different “scenes” you need throughout the day. Think of “scenes” as the multiple activities you do regularly (eating, cleaning, playing games, reading or homework, entertaining, listening to music, watching television, or even waking during the night). To optimize the lighting of your home, you really should work with a properly trained interior designer or a lighting designer –two kinds of professionals we utilize for our projects when required. However, we also believe that you should have an electrical engineer present so that they are able to see what you want for the rooms while a professional designer is there. Consider looking at Richtek Electrical. This may make it easy for them to understand what you want for your rooms, and the best way for them to go about it. For example, Elmhurst-based interior designer Linda Fougerousse, principal of Interior Transformation, Inc., says there are so many little things to consider that make a big difference with respect to layout. A good example of this can be found in the kitchen, where we spend a huge portion of our time. “Placing can lights 18 inches off the wall is the ideal spot because it clears the upper cabinets (while still highlighting them) and hits the countertop, too. Often times, people mistakenly put cans 24”-30” off the wall, but at that location, the light is actually behind you and your body is then casting a shadow on the work surface in the room,” explains Fougerousse. She recommends using a 5” can light fixture with either a clear alzak or haze trim because of each’s beneficial reflective properties. Backlighting stair risers: This provides a dramatic ‘wow factor’ and acts as a safety feature, too. It works great outside the home. 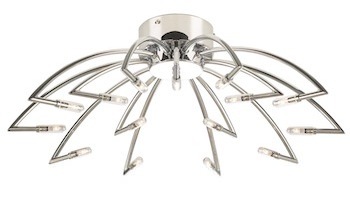 LED light fixtures as art: Avant-garde metal and stainless steel components of an LED fixture make homeowners feel like they’re getting more of a sculpture instead of a lighting source. Sconces: Though always a classic decorative touch in dining rooms and bathrooms, more homeowners are opting to place sconces in a more unique spot – above nightstands in the bedroom – instead of table lamps. It will make a statement! Master Bedroom: For avid readers, consider the layout of the overhead recessed fixtures. For the person who sleeps on the left side of the bed, their lighting controls should be on the right side of the ceiling – the opposite side – and vice-versa to avoid any glare on the book. Have you ever walked into a room where you’ve had to rifle through all of the light switches before you found the right one? It’s like a comedy routine that isn’t funny. Here’s the good news: consolidation of the switching placement and installation solves that problem. Whenever we have the opportunity to create an automated lighting system for our clients, we’re proactive about ensuring that the switches are placed in the best possible locations with no clutter. We’re purposeful and intuitive regarding the switches that control each light or set of fixtures; this results in a more practical, less cluttered type of switching. Linda and I are big fans of Lutron-controlled integrated lighting systems because we see the enhanced flexibility and practicality they provide for our clients. 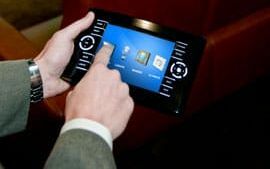 When you have the ability to automatically control your house by the push of a button that is wirelessly connected to a remote central panel, life becomes easier. For example, if you wake up in the middle of the night for a drink of water or to use the restroom, you can light up the pathway to the kitchen or bath via the remote on your nightstand. That’s sheer convenience. And of course, this technology can be integrated with your iPhone and other devices, which offers additional security while you’re not home. 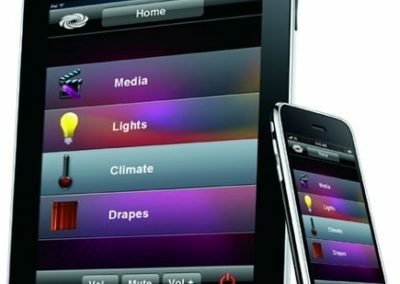 If you are motivated by convenience, security, or an overall appreciation of ambiance and scene-setting, you should consider a home lighting automation plan. Advancements in technology have made it affordable, too. Whereas in the past, homeowners had to purchase an expensive whole-house automation package, that’s not the case anymore. Lutron offers an a-la-carte type of selection where you can choose to automate just one room in the house to start out without making a big initial investment. Later on, you can choose to expand into other rooms. Finally, even if you wouldn’t count yourself among those who weigh heavily the aesthetic, security and convenience aspects of your home lighting plan, I would suggest you view lighting control and fixture selection as a means of saving your hard earned money. Check out the energy usage comparison provided here to see just how substantial the savings can be. By introducing dimmer switches, room motion detectors and efficient lightings scenes, the savings escalate further (as a side note, I’ll go on record as one who is not fully on board with the compact fluorescent lamp option for safety reasons, but will address this issue in a future post). What’s the bottom line? If you’re contemplating a home remodel or new build, don’t forget the lighting; be sure your general contractor works with an interior designer or lighten design professional that uses the latest technology to create a smart, integrated lighting plan to illuminate your home.